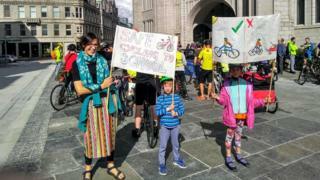 Dozens of cyclists have staged a demonstration in Aberdeen over the lack of dedicated paths on the city's new bypass. The road project is expected to be fully open by late autumn. Aberdeen Cycle Forum said there should be segregated bike paths along the route and better provision to allow cyclists to cross it. Transport Scotland said the bypass would reduce traffic levels on other routes, increasing cycle safety. Campaigner Rachel Martin said: "I think they think cycling is just for leisure. Actually, cycling is a legitimate form of transport. "Building direct, safe, segregated cycle paths to important destinations like the airport, the Deeside Way, the beaches could be a huge boon for the region but we have missed that opportunity because they didn't build the path at the time the road was constructed." Transport Scotland said it had given the city council a grant to improve cycle infrastructure where it saw fit. The council said it had applied for funding under a bypass mitigation scheme for "several pathway and cycleway improvements" around the city. The £745m, 28-mile (45km) Aberdeen bypass was given the green light by Scottish ministers in 2009, but was delayed by legal action. The first main part - between Parkhill and Blackdog - opened in June. A special event at the weekend allowed thousands of people to walk and cycle part of the bypass route ahead of it opening. It also gave them the chance to see structures including a special bridge for wildlife.